Let’s optimistically assume that all printed books go through at least one round of copyediting. With print publishing having to cope with economic recession, there’s still hope that the industry standards have not dropped beyond reasonable. * Three-quarters said their books were copyedited by more than one person. More importantly, at least all non-self-published books were copyedited, by at least one person. A quick glance proves that this is not the case with online content. If we allow typos to creep in while we socialize online, blog, or send personal email, it’s our decision — and our sloppiness is on us. However, as we all know, to be taken seriously, in both professional and personal realms, it’s essential to have your content read by a second pair of discerning eyes. If you blog, but can’t afford to hire a professional editor, ask a relative or a friend to read over your posts to at least catch the typos. If flying solo, step away from your computer for a few minutes, then come back and try to give your creation a fresh and thorough once-over. This point seems beyond obvious, if not preachy, but, in the age of downsizing, the ever shrinking attention span of the reader, and the bite-sized quips (hello, Twitter), many online content providers don’t seem to bother much with adhering to a set of standards, such as the Associated Press style rules, or the The Chicago Manual of Style, or with creating a blend of their own house set. This could be both good and bad. The bad part is that lack of consistency in format and style, as well as grammatical errors, undermine the validity of your content. Little things like paragraphs or quotes that are too large, broken links, inappropriately chosen images and annoying colloquialisms will make the reader walk away without giving you a second chance. The big things like incorrectly credited sources or improperly used copyrighted art can get you into a sea of legal trouble. The good part, the Internet allows us unprecedented freedom to step away from the old-school journalism rules, and make our own. “Smart phone” or “smartphone”? “Email” or “e-mail”? “Copy editor” or “copyeditor”? Italics or quotation marks for titles and headlines? Is it okay to use “okay”? And start a sentence with an “and”? We tweet, we friend, and we trend — thus we capitalize, hyphenate and make verbs accordingly. More often than not I see titles or headlines not being capitalized, numbers under 10 not being spelled out — and that is absolutely fine with me. Sometimes simply Googling the term quickly determines which version wins: the one with the most entries. 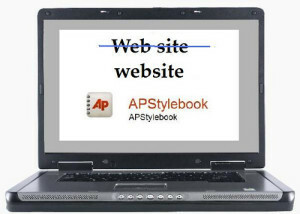 At SixEstate, our house style is AP, but we find ourselves deviating a bit. For instance, we no longer spell “percent,” but use the % sign instead. The sky hasn’t fallen on us yet. It doesn’t matter whether you put blog titles in italics and use quotation marks for film titles on your blog — or you don’t. As a humble copyeditor, I pick my battles carefully, and acknowledge that language usage is a somewhat arbitrary matter of preference. In other words, I am not better than you, and I can’t tell you what to do. I can, however, catch a few typos that you’ve been staring at (and not seeing) for an hour — hopefully without adding any of my own. What matters is the text. Is it clear? Is it accurate? Is it grammatical? That’s what you care about most, and that’s what I care about most.